After a long holiday truce between Legion and Exile forces, war resumes on Delta V. The war for the fate of the Barrens Outpost begins today! 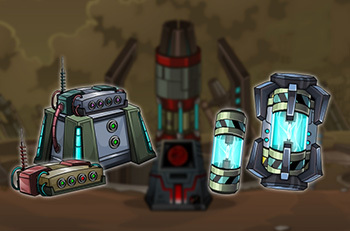 The Legion will battle to defend the powerful Barrens Turret Array while the Exile will attempt to undermine their control through hacking terminals. Hacking terminals are already scattered throughout the Barrens Outpost. Set your starting location for quick access to these crucial war points. The prize at stake is the Barrens Turret Array. Access the Control Panel, control the Barrens. 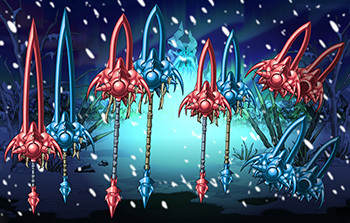 Those who faught against Dravax and the Dragonoid remember the potency of these mighty guns. If they can wound an interdimensional dragon they'll have no problem turning an armada into scrap. 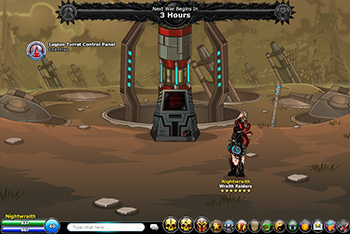 Win PvP battles to earn war drops and boost the score of your alignment! 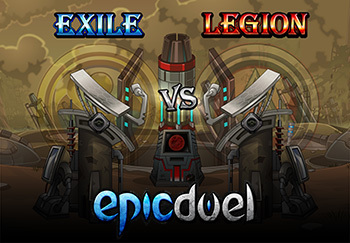 The Legion took the last region; can they continue their winning streak or will the Exiles emerge triumphant? Remember that this is also an opportunity to earn Barrens Outpost influence to build up your regional achievement! Let's see some red stars! Guest artist Bidoof has crafted a timely set of New Year's gear available at Torgan in Frysteland! What time is it? Time to DUEL! One again, we prepare for war. Good luck and good dueling!